The Rice Marching Owl Band, better known as the MOB, always performs its unofficial fight song “Louie Louie” with enthusiasm. Here, director Chuck Throckmorton, drum major Bonnie Miller ’19 and drum minor Bailey Covell ’20 dance the hand jive for a crowd of Rice football fans before a game. 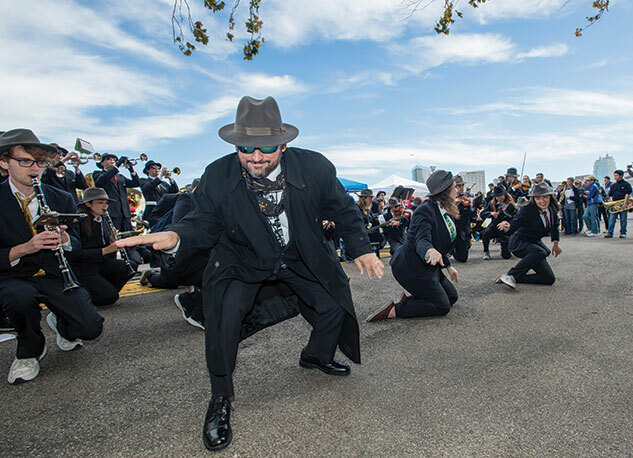 In a temporary departure from the band’s usual satirical shows, the MOB joined the University of Houston’s marching band this season to perform “Amazing Grace” as a celebration of Houston’s resilience. The MOB also invited Louisiana Tech’s marching band onto the field to play a tribute to The Beatles’ “Sgt. Pepper’s Lonely Hearts Club Band.” See this issue’s Family Album article for a profile about John “Grungy” Gladu, a long-standing MOB trumpeter and the namesake for the new band hall.